First and foremost, I apologize for not posting this recipe before Thanksgiving. Whoops! Better late than never, right? My mom shared this recipe with me 10ish years ago, and I’ve been making it ever since. It’s everything mac n’ cheese should be – thick, creamy, cheesy, spicy, and most importantly, comforting! There’s nothing healthy about it, but in my opinion, when you only make a dish once or twice a year, who the hell cares! So if you do decide to make this, serve yourself a huge bowl and eat with zero regrets. Because that’s how mac n’ cheese should be enjoyed! 2. Cook macaroni according to package directions. 3. Melt 4 tablespoons of butter in a large saucepan. 4. Add garlic and cook until garlic is light brown in color. 5. Stir in flour and cook for 2-3 minutes. 6. Gradually whisk in milk and cook for another 3-5 minutes. 7. Add cream cheese, cheddar cheese, mustard, hot sauce, cayenne pepper, and salt & pepper. Stir until smooth and creamy. 8. 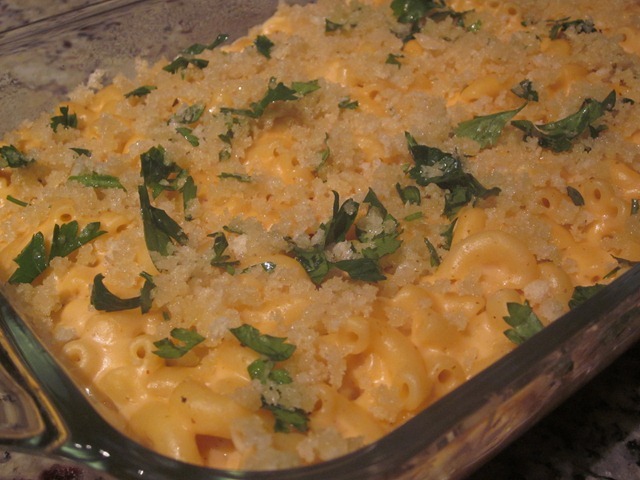 Drain macaroni (when ready) and add to sauce to coat. 10. Melt remaining 2 tablespoons of butter and stir in breadcrumbs. 11. Evenly top mac n’ cheese with breadcrumb mixture. 12. Bake for 20 minutes. NOTE: This dish is best served right out of the oven, so try to time everything accordingly! What’s your ultimate favorite comfort food? I have two – mac n’ cheese and chocolate chip cookies. I couldn’t agree more — food tastes best without a side of guilt. I’d have to say that chocolate chip oatmeal cookies are my biggest comfort food, mostly because they remind me of baking with my mom when I was teeny tiny. i agree – i made one bowl Martha Stewards chocolate cake with chocolate ganache over thanskgiving and absolutely enjoyed every bite. I have started liking mac n cheese alot lately, esp the spicy kind. OMGGGGGG… this is calling my name, so many new ingredients here, cream cheese, mustard, siracha I already add, but wow! I’m so making this… probably around Christmas time. I don’t skimp on fat if it’s around the holidays, but then i cut down on butter on normal days cuz I really love M&C. Thanks to you and your mom!! !